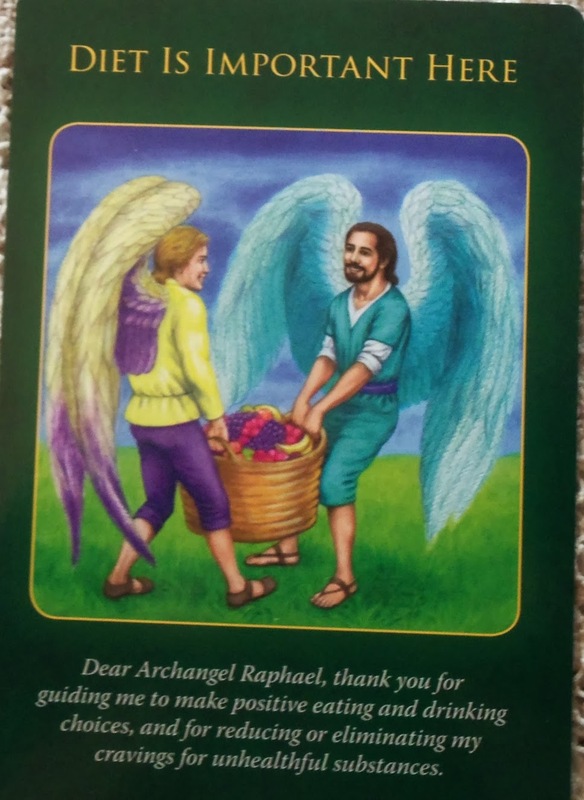 Card of the Day ~Diet Is Important Here~ Archangel Raphael says that food is medicine, and he brings you this card as a reminder of its curative properties. Instead of looking at a balanced diet as removing something enjoyable, why not reframe it so that you view nutritious foods as adding to your life’s enjoyment? It feels good to eat healthfully, knowing that you’re supporting your body’s energy through sound choices. 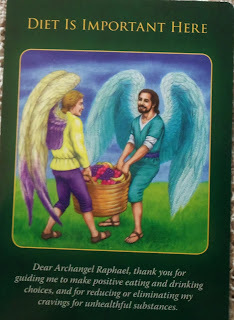 This card jumped out of the deck to validate what your angels have already been telling you intuitively: it’s time to make positive dietary changes. You can do this gradually if you prefer, as even small concessions in the direction toward improved food choices can make a difference. By saying the prayer below, Archangel Raphael will help you reduce or eliminate unhealthy cravings. You may have noticed that every time you eat something that isn’t good for you, you feel guilty and you may not feel so good to your tummy or energy wise. When you eat healthy your body rejoices and thanks you for the nutrition it desperately needs to correctly function without depleting nutrition to parts of your body. When we don’t eat healthy our body has to play the favorites game by spreading nutrition to all parts of the body but mostly to organs which; is why you may notice you get acne, lose your hair, eye sight is not a clear as it used to be, illness effects you really easy and so on. Nutrition gives your cells and immune system the strength to fight off the bad guys. For fun I always see my cells and immune system as professional boxers going in the ring against the bad guys (disease, flu, colds, cholesterol, high blood pressure, bad fat, stress etc). When I can visualize feeding my team all the vitamins and nutrients it needs as well as get exercise I know my team is always going to win in the boxing ring. I pray you have a fantastic day. I love you all!